DC Direct's First Appearance line, for the first two waves, focused on iconic characters and gave us figures done in the simpler style of old-time comics. The First Appearance line was kind of a campy nostaliga-fest... until now. The third series is unique in a few ways. First, we're getting a few modern characters like Batgirl and Nightwing. Second, the entire wave is Batman-related (in addition to Batgirl and Nightwing, we get The Riddler and "Composite Superman", a villain who is physically half Superman, half Batman). For Batfans, this a treat. For DCD fans who are tired of the company proclaiming that this is "The Year of the Bat", you can almost hear the collective sigh of disappointment. This review tackles Batgirl, but instead of giving us the first appearance of Barbra Gordon (the original Batgirl), DCD has elected to make a figure of a character never before seen in plastic form: Cassandra Cain, the "other" Batgirl. The blurb on the back of the box states the following: After being taken in by Oracle, the original Batgirl, Cassandra Cain donned the cape and cowl of the all-new Batgirl in 1999's Batman #567! To add a little more to that story, it's worth mentioning that this Batgirl is the token hot Asian chick in the Bat-family, and she learned to kill before she learned to talk. Nasty. This figure has been criticized by many for its exaggerated musculature, awkward pose and melon head. Personally, I don't mind any of these qualities. 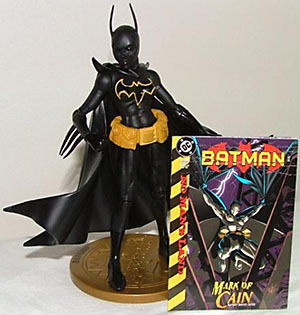 The gargantuan cranium and super-ripped muscles of Batgirl are the fault of the source material, since this figure is meant to parallel her first appearance in comics, and all one has to do is leaf through the included mini-comic to see that she's sculpted as she's drawn. Of course, flip through and you'll also see that she never "donned the cape and cowl of the all-new Batgirl" in the issue - this is her first appearance, but she didn't become Batgirl until a few months later, in Legends of the Dark Knight #120. As for the pose, it is a little awkward, but not painfully so. DC Direct has a habit of sculpting their female figures in a strange contrapposto, with the weight on one hip and the torso slightly twisted, and while it isn't pulled off here as well as it is on, say, DCD's Harley Quinn from the Hush figure series, Cassandra's stance is far from a figure ruiner. The sculpt has some really nice touches, like the individual stitching around the facemask and the raised bat symbol on the chest. While DCD has usually opted for cloth capes in the First Appearances line, Cassandra gets a soft rubber sculpted cape, to better match the art. It looks nice and dynamic, but it gets in the way of the arms somewhat. The paint on Batgirl is subtle but well done. Her full bodysuit is mostly done in matte black, with gloss applied to the boots, gloves, eye goggles, facemask stitches, and bat symbol. The symbol's raised outline is painted yellow, and while it's not as even as it could be, it doesn't look bad. Her cape is gloss black on the outside, matte black on the inside. Her giant utility belt is a separate piece that moves freely on her waist, and while at first it appears to be molded in a single color, closer inspection reveals that the buckle is actually painted a lighter yellow than the rest of the belt. Very subtle, and a nice touch. The figure has 12 points of articulation, which doesn't sound like a whole lot, but it's actually something of a milestone for DC Direct. Cassandra has a balljointed head, unnecessarily restricted balljointed shoulders, hinged elbows, peg wrists, t-crotch hips, hinged knees, and... wait for it... a waist joint! For years DCD has been inexplicably avoiding waist joints on figures that obviously would benefit from them, and it looks like they may finally be listening to what must be a constant stream of complaints from nearly every collector regarding this issue. A waist joint! Hell has frozen over. Aside from the miraculous inclusion of a waist, the balljointed head works great and has a large range of motion, and it's unfortunate that the same can't be said for the shoulders, which are needlessly restricted in typical DCD fashion. DCD is often pretty inconsistent with its inclusion of accessories, but thankfully Batgirl fares pretty well. All figures in the First Appearance line feature a golden base with the name of the figure printed on it, along with the name, issue number, and year of the first comic they appeared in (for Batgirl, it's Batman # 567). Every First Appearance figure also features a mini reproduction of the comic in which they made their debut, a neat little inclusion reminiscent of those mini newspapers that kids get when they go on field trips to the local newspaper headquarters. It helps justify the price point, which varies wildly on DCD figs from vendor to vendor and can often seem a tad high when accessories are scarce. 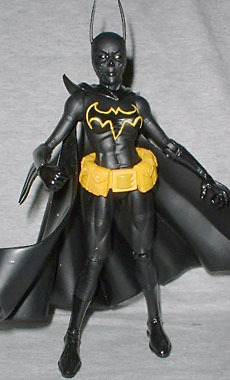 Finally, Batgirl comes with a little batarang that her left hand is sculpted to hold. It's pretty detailed for such a small accessory, and it features little sculpted, non-functioning hinges that suggest this is the type of batarang that folds in half. Pretty spiffy! This is the first figure offering of this version of Batgirl, and it's a solid effort. Complaints of balloon head syndrome, thunder thighs and the biggest pouches on any belt ever are issues with the source material, not the actual figure. All in all, it's a decent addition to any DC fan's collection, and a must-have for fans of the Caped Crusader. 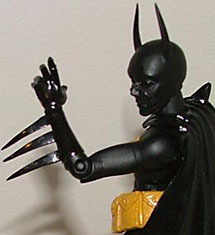 But before you purchase, a caveat: pay special attention to the ears of the mask and the spikes on the gloves. The plastic used for these figures caused many I saw on the pegs to have bent ears and glove spikes. However, it's a minor issue, and I was able to find one that suited me without a problem. Who's a better Batgirl: Barbara, Cassie or Bette Kane? Tell us on our message board, The Loafing Lounge.